Whether you're building an AR-15 or buying a complete AR-15, we've got all the info you need on barrels in this guide. To start, we'll cover essential information about length, twist rate, materials, and more. Then we'll give you our picks for the best AR-15 barrel manufacturers and barrels. To learn more about choosing the best barrel, click the expandable section below. Alternatively, you can just take our word for it and move onto our picks. 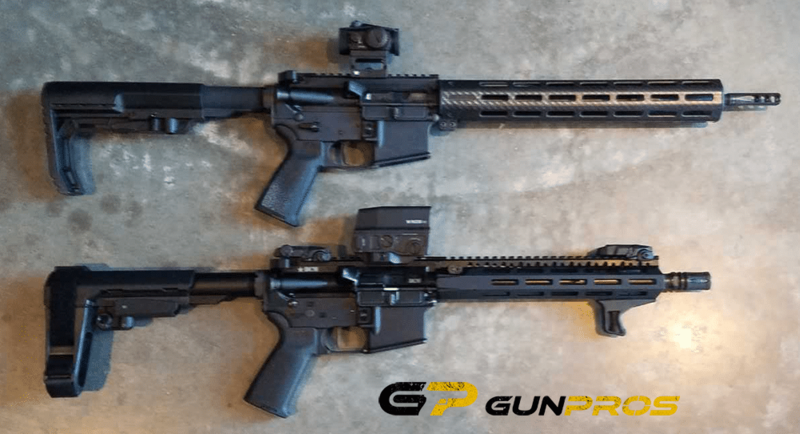 Though the AR platform has been adapted and used for a huge variety of calibers, we're going to be focusing on the AR-15's standard 5.56 NATO / .223 caliber. In addition to being the "default" caliber, it's also the caliber most commonly used by civilians, the U.S. Military and NATO forces. Barrels labeled 5.56 can shoot both 5.56x45 NATO and .223 Remington. Barrels labeled .223 can likely only shoot .223 safely, as they are not rated for the higher pressure of 5.56. With that said, some manufacturers label their products .223 because they're designed to perform best with .223, but they can still use 5.56. If you do have a .223 barrel, always confirm with the manufacturer that it's safe to use 5.56 before attempting to do so. Barrels labeled .223 Wylde are typically safe to use with both 5.56 and .223, though they were designed to take advantage of .223's accuracy advantage. These barrels are frequently used for some shooting competitions with high-grain ammo. If you're not sure what to pick, we'd recommend getting a 5.56 barrel or .223 Wylde Barrel. It's better to be able to shoot both calibers than just 223. A barrel's twist rate is the distance it takes for the barrel's rifling to make a complete 360 revolution. This is measured in inches and commonly displayed as a ratio like 1:7, 1/7, 1-7, or 1 in 7. In this example, the rifling completes a 360 revolution every 7 inches. If you're still experiencing any confusion, the picture to the right should help. The optimal twist rate for a bullet is calculated based on the projectile's length, diameter, and weight. Since we're focusing specifically on 5.56 and .223 calibers, bullet weight is the most important thing to pay attention to. Here are the general guidelines for twist rate in relation to bullet weight (in grains). Here's another look at bullet performance in AR-15 Barrels with the most common twist rates. For the average person, without a specific goal in mind, you'll likely be shooting 55-grain .223 most of the time, as it's the cheapest ammo available. You can either choose to optimize your AR-15's barrel for this by going for a 1:9 twist... Or you can not. I frequently shoot 55 GR .223 out of my 1:7 barrels at distances below 100 yards. When I occasionally want to push out to further distances, I use a heavier bullet, which is best for long-range shooting anyway. Basically, I'd rather optimize performance when it's most important—at long range—as any drop in performance doesn't really matter at closer ranges in my opinion. Given this preference, I usually end up with a 1:7 twist 5.56 rated barrel, though the less common 1:8 is likely best if you can find one that fits your other criteria. Perhaps the most important factor to consider when choosing an AR-15 barrel is its length. There are legal, performance, and purpose considerations to take into account. The federal minimum length for a rifle barrel is 16". PERMANENTLY attached muzzle devices (e.g. welded on devices) are included in this length, so it's common to see 14.5" barrels with permanently attached muzzle devices sold in complete rifles/uppers or as components to be used in a rifle. If you want to build or buy a rifle with a barrel shorter than 16", there are two options. Short-Barreled Rifles (SBRs) - A short-barreled rifle is a rifle with a barrel length less than 16" or with an overall length less than 26". It is an NFA item, meaning you must first complete and submit a Form 1 to the Bureau of Alcohol, Tobacco, Firearms and Explosives (ATF), pay a $200 tax stamp, and wait for ATF approval. Do NOT build an SBR before getting approved. The approval process can take 6-10 months. AR Pistols - The easier option is to build an AR-15 pistol, which if done correctly, is NOT legally a rifle. You can NOT attach a shoulder stock to an AR Pistol, as that would make it an SBR. You can, however, attach a pistol brace—though it's legally murky as to whether or not you can shoulder it. You also can NOT attach a vertical foregrip to a pistol with an overall length less than 26". With that being said, I avoid attaching any vertical foregrips to AR pistol builds even when they exceed a 26" OAL, as I don't want to be accosted by an uninformed police officer or range employee over an accessory I'd never use anyway. Faxon FX5500 Ultralight AR-15 Rifle w/ 14.5" Barrel with perm Muzzle Brake (16") and BCM 11.5" Barrel Upper, Custom Lower AR-15 Pistol. Note the SBA3 brace is NOT a stock and I have an angled foregrip, not a vertical grip. Disclaimer: We're not lawyers and this is not legal advice. Always do your own research and comply with your federal, state, and local laws. Perhaps the most telling study on the performance of AR-15 barrels of varying lengths was this one done by Small Arms Defense Journal. They compared bore pressure and velocity between barrel lengths using 63-grain ammo. Bore Pressure - Generally, the shorter the barrel, the higher the bore pressure is at bullet exit. Shorter barrels lead to louder shots, greater flash intensity, and more ware on suppressors. Velocity - Longer barrels generally lead to greater muzzle velocity, though there are diminishing returns at lengths greater than 20". My Takeaway From the Study - If you're primarily looking for a rifle to shoot at long distances, you should probably use a 20" barrel. For home defense and close quarters tactical use, stay at or above a barrel length of 10.5". Why are you building this AR-15? While some statistics may be worse for an 11.5" barrel than a 20", that doesn't mean a 20" barrel is right for every job. In fact, the U.S. military has been steadily adopting shorter barrels over time, including the M4's 14.5" barrel and even 10.3" barrels used by Special Operations Forces. A shorter barrel is better for maneuverability and concealability/storage. In other words, a shorter barrel is likely better for a home defense gun, SHTF gun, or truck gun. You can also realistically still hit steel up to 300 yards without being a professional shooter. Recommendation - If you're not sure what to choose and don't have a specific purpose in mind, I'd recommend either a 16" barrel or 11.5-12.5" (if you're willing to get an SBR or an AR Pistol). A 14.5" barrel with a permanent attachment putting it at 16"+ is another great option, but be sure to put some thought into the muzzle device. It's not just the length of the barrel you need to consider, but also it's shape, weight, and thickness. There's a variety of different barrel profiles to choose from, which we'll quickly cover the basics of. This picture (below) from ar15barrels.com is a good illustration of the general differences between AR-15 barrel profiles. With that said, many of the best barrels on the market today are uniquely contoured. As the names suggest, lightweight or pencil thin barrels can shave off a significant number of ounces, especially when compared to the heaviest profile options. This comes at a price, however, as they tend to have more barrel whip negatively affecting accuracy. They also get hotter, faster, which exacerbates this problem. That being said, I tend to like these barrels for range-toy builds. For combat, SHTF, home defense, and general shooting purposes, the best AR-15 barrel choice is usually a medium or gov't profile barrel. There are also some blended profiles, like Faxon's Gunner, that arguably give you the best characteristics of both the gov't profile and pencil profile. Barrel materials play a role in the accuracy and durability of your rifle. There's a good bit of misinformation, conflation, and BS from manufactures when it comes to the material they use for their barrels. Basically, some try to make it sound like they're using a better material than they actually are. Thankfully, this doesn't really matter unless you're planning to do a lot of sustained full auto fire... which you're probably not. Mil-B-11595E - Commonly considered to be the "best" barrel material option, Mil-B-11595E adheres to military specifications. This is what the U.S. Military uses, and thus, it's likely optimal for combat. If you actually are planning to do a lot of full-auto fire, check with the manufacturer to be sure their barrels are actually Mil-Spec. 4140 and 4150 - You'll see the terms 4140 and 4150 steel thrown around. The 40 & 50 specifies the amount of carbon in the steel, so around .40% or .50%. The higher carbon content is preferred. You'll also see terms like 4150 CMV or 41V45. These are sometimes up to the above Mil-Spec, but don't necessarily guarantee this. These barrels include Vanadium, which helps make them tougher. Again, I wouldn't worry too much about this, but you should feel very confident using a "4150 CMV" from a reputable manufacturer. Stainless Steel - 416 match grade stainless steel barrels are best if long range accuracy is really important to you. They are, however, more expensive and have shorter lifespans. Stainless Steel / Carbon Fiber - The new hot trend is barrels with thin layers of stainless steel, wrapped in carbon fiber. Carbon fiber is stronger, lighter, and dissipates heat better than other materials. Naturally, these are the most expensive barrels around. If you can afford it, go for it! Barrel linings improve corrosion resistance, extend barrel life, and make cleaning them a bit easier. Chrome Lining is an additive process in which chrome is bonded to the inside of the bore. Nitride/Melonite treats the inside of the bore, rather than adding material to it. Nitride is cheaper, offers similar barrel life when shooting semi-auto, and has less of a negative impact on accuracy. Unless you're shooting full-auto, I see no reason not to go with Nitride. Cold Hammer Forging (CHF or BFH) is a barrel forging process used to increase durability. Again, this comes at a small sacrifice to accuracy, but could help extend the life of your barrel a few thousand rounds or more. It also comes at a pretty significant cost vs non-CHF barrels. In our best AR-15 cold hammer forged barrel section, I discuss why I think this isn't worth the cost for most needs and uses. Magnetic Particle (MP) testing is a nondestructive process that uses magnetic currents to test for cracks or defects in barrels. High-Pressure (HP) testing is high-pressure testing, which is a destructive process. Personally, I want manufacturers that MP test each individual barrel. I'd recommend ensuring they're NOT just batch tested if you plan to put your life in the hands of a barrel. While some AR-15s use a piston system, most use a direct impingement (DI) system. A DI AR-15 directs gas from behind a bullet into the gas tube, which then moves the bolt back, removes the spent casing, and strips a new round off of the magazine into the chamber. So Why Are We Covering This in a Barrel Guide? The barrel you purchase will have a gas port drilled into it and sometimes even come with a gas block and gas tube... So you need to decide what gas system length you want. Gas system length is the distance between the gas block and where the gas tube meets the bolt carrier group's (BCG's) gas key. The table below shows general rules for choosing a gas system length. Basically, the only time you're likely to have to make a decision is when you have a 14.5-16" barrel. I always opt for a mid-length system due to it's lighter recoil, which comes as a result of less gas entering the tube. This also reduces wear on your rifles parts. With all of that covered, we're moving onto the best AR-15 Barrels. Here are the manufacturers who, in our opinion, make the best AR-15 barrels for the money, along with their products. Ballistic Advantage barrels are our choice for the best AR-15 barrels for the money. They're priced to fit nearly any budget, and the company guarantees sub-MOA accuracy for all their barrels. BA offers 4 barrel series: Modern, Performance, Premium, and Fluted Premium. We'll be skipping the Modern series because they're not MPI tested, but those building on a short budget can check them out here. Ballistic Advantage's Hanson Barrels are a proprietary barrel profile. The BA Hanson profile is a shoulder-less design which cuts down on barrel whip and thus benefits those shooting at a high rate of fire or full-auto fire. In our minds, this makes it a great cost-effective option for home-defense rifles, SHTF rifles, or just general range fun. BA Hanson Performance Barrels are made from 4150 Chrome Moly Vanadium (CMV) Steel and have a Melonite lining. All of these barrels are both high pressure (HP) tested and magnetic particle inspection (MPI) tested. Ballistic Advantage offers these barrels in lengths from 7.5" to 17.7". All Hanson Performance barrels have a 1:7 twist rate. Click here to find all available lengths. BA Hanson barrels also come with a low-profile pinned gas block at no additional cost, and you can even upgrade at checkout to a Superlative Arms Adjustable Gas Block. For those of you that demand the best long-range performance, Ballistic Advantage offers their Premium Series of 416R stainless steel .223 Wylde barrels. For those not aware, .233 Wylde barrels offer increased accuracy and are often used to shoot heavy-grain .223 ammo in competition. Unlike normal .223 barrels, they have the ability to also safely shoot 5.56 NATO ammunition. Within this series of barrels, BA has 4 profiles to choose from, all of which have a 1:8 twist rate. Some of these profiles also offer fluted options, which can reduce weight by up to 1 lb. They are also all HP and MPI tested. The main differences between the Hanson Premium barrels and the Hanson Performance barrels is that the Premium barrels are made from stainless steel and have a 1:8 twist rate. Hanson Premium barrels are available in lengths ranging from 10.3" to 18". BA's SPR barrels range from 14.5"-18" and are specifically designed for long-distance shooting. As a result of their design, they are heavier than Hanson profile barrels (8 oz heavier when comparing 16" Hanson to 16" SPR profiles). That is unless you decide on a fluted SPR, which only weighs 0.4 oz more than the Hanson profile, while still offering improved accuracy. The BA DMR (Designated Marksman Rifle) barrel is essentially just the 20" version of the SPR profile. It's available in both fluted and non-fluted models. For those looking for barrels outside of the standard 5.56/.223, Ballistic Advantage also makes AR-15 and AR-308 barrels in .224 Valkyrie, 6.5 Grendel, 9mm, 300 Blackout, 308 Win, and 6.5 Creedmoor. Faxon seems to be the most commonly recommended manufacturer of affordable AR-15 barrels today. Just because they're popular doesn't necessarily mean they make the best AR-15 barrel, but they're certainly in the conversation in terms of the value you get for your dollar. The company is based out of Cincinnati, Ohio so I'm also happy to see a company located where I grew up have so much success in this industry. Faxon offers extremely high-quality manufacturing with over 40 of experience in defense, aerospace, medical, automotive, and other industries. Since 2011, they've been applying their knowledge to barrels and now even complete rifles. They're also known for their exceptional customer service in the unlikely event you have anything wrong with your products. Compared to some other barrel manufacturers, Faxon has a wide variety of offerings. All of their barrels are made using either 4150 Mil-Spec CMV steel or 416R stainless steel, so we'll be using this as a starting point to breakdown what's available from them. It's also important to note all Faxon barrels have a 1:8 twist rate, which we feel is optimal for most shooter's needs. All Faxon barrels are stress relieved and go through a variety of testing, including magnetic particle inspection. 4150 CMV barrels all have a QPQ Nitride finish. Now for the various Faxon 4150 barrel profiles. Faxon is known for making super high-quality lightweight parts. Perhaps the most extreme example of this is their pencil barrels. A 16" Faxon pencil barrel weighs about 2/3 of what a Govt profile 16" barrel typically weighs. While this may not sound like a crazy difference to some, the 10 oz of savings can make a drastic difference in comfort and weight balance. The downside to this profile is that it gets hot pretty fast and begins to lose accuracy at that point. While it definitely doesn't make sense for combat, long-distance shooting, or as a SHTF weapon, it's perfect for a range toy build or even as a part of a home defense gun. Faxon's pencil barrels are available at 10.5", 14.5", or 16". You can also get a 14.5" barrel with a permanently attached 3 prong flash hider or 3 port muzzle break. Naturally, the barrels with permanently attached muzzle devices are more expensive than those without them. While Faxon is known for their pencil profile, the Gunner barrel profile is why many people end up choosing Faxon. The Gunner profile starts with a Govt profile taper, then moves into a 1.9" long gas block journal, and finally is pencil width to the muzzle. This allows it to both reduce weight and have superior balance compared to conventional barrels, while still improving heat resistance. The 16" barrel weighs about 8 oz less than many 16" Govt profile barrels. Gunner barrels are available in 11.5", 14.5", 16", 18", and 20". Again, you can also get the 14.5" barrel with a pinned 3 prong flash hider or 3 port muzzle break. While I own and like Faxon's FX5500 Ultralight Complete AR-15, which has their pencil barrel, I'd personally opt for the Gunner profile for most builds. Rounding out our Faxon 4150 CMV barrel section is their Gov't / Socom profile. While it doesn't have the weight savings of their other profiles, it still is made with the exceptional detail of all Faxon barrels. The Gov't / Socom profile is available in 7.5", 10.5", 14.5", 16", 18", and 20" lengths. Faxon does not offer this profile in 14.5" with permanently attached muzzle devices. For those focussed on building an AR-15 with superior accuracy, there's Faxon's Match series 416R stainless steel barrels. All of Faxon's 416R barrels are chambered in .223 Wylde and have a 1:8 twist rate. These barrels are 5R rifled, which reduces projectile deformation and makes barrels easier to clean. They are lined by a salt bath nitriding process and go through the same testing as the 4150 CMV barrels. In addition to their 4150 CMV option, Faxon offers their famous Gunner profile in 416R stainless steel. These are available in 14.5", 16", and 18". The heavy fluted barrels from Faxon offer top-shelf accuracy while reducing the weight of your standard heavy profile barrel. Available lengths: 16", 18", 20". Last but certainly not least from Faxon is their Match series Flame Fluted barrels. In addition to offering a more interesting aesthetic to traditional fluted barrels, the flame fluting arguably helps reduce stress to the barrel. Unlike typically fluted barrels, this design avoids having any long straight sections of thin steel. It's available in 14.5", 16", 18", and 20". If you're looking for the best long-distance AR-15 barrel at an affordable price, Faxon's 18' or 20" flame fluted barrels are great options. Cold hammer forging (CHF) is a manufacturing process in which hard steel is used to "hammer" a barrel into shape while keeping the barrel at relatively "cold" temperatures. They are hammered against the reverse imprint of the rifling as opposed to the more common "button rifling" process. CHF barrels are all the rage these days, with many users claiming they have better barrel life. Unfortunately, there's no definitive testing I've found that proves a substantial increase in barrel life for CHF barrels, though they are higher in tensile strength. That being said, from what I've seen from others and experienced myself, there does seem to be an increase in barrel life, but I personally don't think it makes economic sense to buy a CHF barrel. What I mean by this is that a CHF barrel costs nearly twice what the barrels above cost, but they do not last twice as long. It's pretty easy to replace a barrel, so you're probably better off just replacing it with another standard 4150 CMV barrel when it dies. It's probably still cheaper even if you're paying someone to replace it each time. Combat or legitimate tactical use. Serious preppers that want to be sure their gear will last as long as possible. Those of you who have the money to spend and just want the best. VERY few companies actually manufacture CHF barrels, so when you buy a CHF barrel branded as an "[insert manufacturer name] CHF barrel", there's a good chance it wasn't actually made by them. One company who actually does make their own cold hammer forged barrels is Daniel Defense. As we've covered in our "Best Complete AR-15s" guide, Daniel Defense has been the go-to recommendation in recent years for battle-ready AR-15s. Much of their reputation has come from their barrels, and thus, they're our choice for the best AR-15 barrels that are cold hammer forged. We pretty much covered everything we have to say about CHF barrels in general and Daniel Defense above. To the left you can see their Government profile barrel. Daniel Defense's cold hammer forged barrels are available in the following lengths: 10.3", 11.3", 12.5", 14.5", and 16". DD also makes a lightweight profile CHF barrel. This reduces weight in the 16" LW barrel by 3.2 oz compared to their Government profile 16" barrel. For further comparison, this 16" LW is still about 2 oz heavier than Faxon's 16" Gunner and nearly 5 oz heavier than Faxon's pencil barrel. Daniel Defense's lightweight barrels come in 14.5" and 16". Though I and many others believe that the barrel is the most important part of any rifle, there are some great affordable options out there that will get the job done for 99% of people. My recommendations as far as the best AR-15 barrel manufactures go are Ballistic Advantage or Faxon Firearms. If you really want a cold hammer forged barrel, I'd recommend Daniel Defense.